And those tiny needles just killed my hands. I persisted for a while after this photo but then i tried on the sock, and it happened to be too big anyway. So I ripped it out. I really love the way knit socks look but after the great tendonitis fiasco of 2006, I know it’s just not worth it (I need my hands!!). I then tried a crocheted sock and several swatches for a crochet or knit hat, and I’m not really loving any of them. 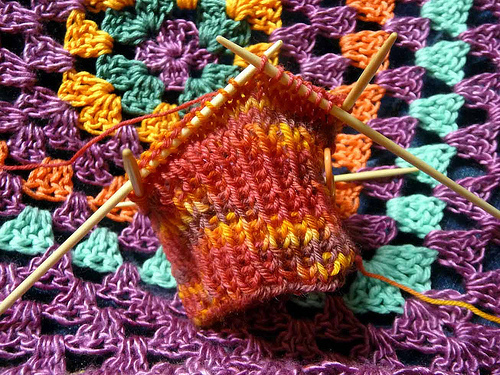 The yarn wants to be knitted, because of the way the colors are dyed (the sections are pretty short for crochet stitches), but it also wants to be not socks, because of my hands. I’ll come up with something…. but for now I’ve frogged them. I also wanted to share a little close up of the patchwork coiled bowl I sent to Valerie at Knitting in Pink as a reminder that the deadline to mail your Patchwork Swap package is TODAY, so please mail your packages. And if you don’t have it in the mail yet, please be courteous and let your partner know that it’s going to be a little late. And please post your sent and received photos in the flickr pool so we can all see the scrappy goodness. Bummer about the start and restart with knitting a sock. But why fight it when it's just not happening?! 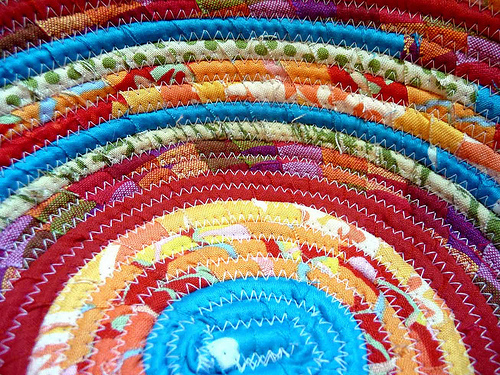 I love the fabric basket you are showing us. I mailed my swap package today, so I hope my partner likes it.